SurfSink…Glass and Seashell Concrete Sink Brings the Beach into Your Bathroom. 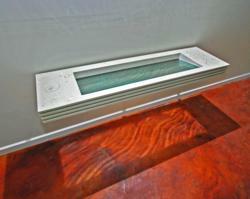 Downing Designs introduces SurfSink…a new addition to their collection of striking sink designs. The interplay of light and water projects rippling shadows upon the floor. 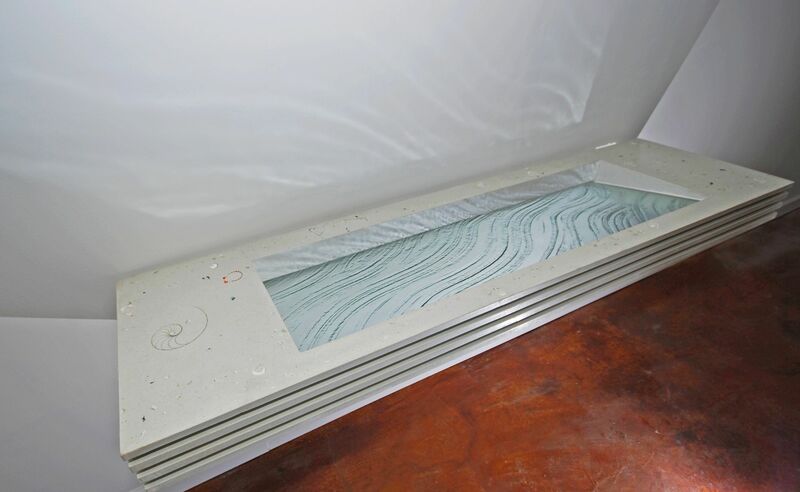 Downing Designs SurfSink fuses textured glass and seashell concrete into a beautiful work of art. Each sink is conceived with detailed client input and then cast into a one-of signature piece. Seashells, including real nautilus and conch, are revealed in the polishing process and invite your touch, while the Mother-of-Pearl shimmers from all angles to produce its luxurious finish. This combination of glass and seashell terrazzo transcends the beauty of the individual elements. No other sink in the world produces such visual and tactile appeal. To render the floating illusion, SurfSink is mounted with steel brackets hidden in the body of the sink, along with the drain. Our suggested lighting scheme allows the interplay of light and water to project through its textured glass to cast rippling shadows upon the floor. Downing Designs is currently the only studio in the world that creates original textured glass and seashell concrete sinks and surfaces for the kitchen and bath. Designers and Architects continue to specify innovative Downing Designs sinks for their modern, contemporary and coastal design clientele. SurfSink has its own Design Guide which offers insight into the design process while also providing useful cost saving tips.